From Old French escalope (“shell”). Any of various marine bivalve molluscs of the family Pectinidae which are free-swimming. One of a series of curves, forming an edge similar to a scallop shell. A fillet of meat, escalope. A form of fried potato. A dish shaped like a scallop shell. 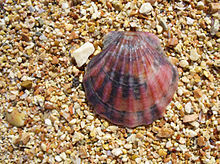 To specify bivalves, rather than fillets of meat or potatoes, sea scallop and similar terms may be used instead. This is particularly done when several of these are used, such as in cookbooks and in parts of Australia. To create or form an edge in the shape of a crescent or multiple crescents. We can scallop coastlines to make them longer to serve more people. Although aggressive, the lesion tends to scallop and not destroy the adjacent osseous structures. The daughter of the family, Katie, was older than I, an accomplished seamstress who helped me sew my first garment, a pull-over apron, and showed me how to scallop the neckline of a linen blouse. On the vertical stone you have to move the glass fairly quickly or it will tend not only to facet but also to scallop, since there is less glass surface touching than with the horizontal. Then, letting go of Option/ Alt, Gordon dragged the widget inward to scallop the corners. And I can scallop those cold boiled potatoes and stew a can of tomatoes. You can scallop, steam, poach, bread, brown, stuff, or put your fish in a sauce, and still have it moist and tender. You can scallop them and if you're good in the kitchen, souffle them. By the way, sometimes cut or chop these potatoes quite fine, and after creaming them put crumbs on top and bake them; that is a good change. Of course you can scallop the second supply, too, or chop and brown them, or serve in any one of a dozen ways; look those things all up, so you will not get into a rut. He has never wanted to live anywhere but the Island, he says, where he can scallop or ice-boat in winter, depending on his mood; hunt bluebills and deer in season; look after his cows and his sheep. The project has just now been completed only for me to find I may not be able to catch scallops by placing the F/V "Miss Sue Ann" into the Occasional catagory. Please let me know how, given the unusual factual situation that I find myself in, I can scallop more than 19 days. Jimmy used to scallop from October to March and bartend a few shifts here and there over the summers when scalloping is prohibited.